We’re back to the book summaries! This is the posting of summaries of each of CW’s books, one book per week, in chronological order, that I was doing for a while and then abandoned at the end of January. I plan to pick this up again for a while, then take breaks for other themes and topics, and continue on through his entire corpus. Just hang on six more years, and we’ll start to get to Williams’s more mature works. But meanwhile, today’s book is a fascinating work that is one of his ODDest. Outlines of Romantic Theology is CW’s first attempt to explicate, in prose, one of his signature concepts: the idea that the “sexual love between and man and a woman…is capable of being assumed into sacramental and transcendental heights” (pp. 7, 9). In the words of this book’s editor, Alice M. Hadfield, Romantic Theology is the belief that “In experiencing romantic love, we experience God” (p. xi). Williams kept working out the nature and implications of this idea throughout his life; this volume was only the first of many such attempts. It was never published in his lifetime; Hadfield edited and published it after CW’s death. His final statement on Romantic Theology came in one of his last books—accounted his best work by some readers—The Figure of Beatrice (1943). The reader should keep in mind, then, that Outlines of Romantic Theology is an incomplete work, a partial statement, an immature view. With that caveat, what follows is some attempt to summarize the concepts and contents of Outlines of Romantic Theology with great brevity. Williams begins Outlines of Romantic Theology somewhat in the middle of things: with his stated assumptions that his peculiar interpretation of love is universal, commonplace, obvious, and orthodox. 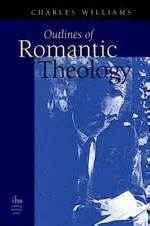 He says that the suggestions he makes cannot appear to every Christian “as anything but natural and probable” (p. 8) and that “Romantic Theology is part of Christian Theology” (p. 8). This is part of what I find both endearing and perplexing about CW: he always appears to think that his own quirky ideas are mainstream. Some scholars argue, in his defense, that they are, only oddly expressed. Perhaps. Perhaps not. The definitions of Romantic Theology that I quoted above emerge gradually, worked into the fabric of his introductory remarks about Christian Theology in general. This contributes to the idea that he thinks his interpretation is commonplace, and also makes it difficult to determine exactly what Romantic Theology is. That’s it. That’s Romantic Theology. Love = Jesus, and marriage = Jesus’s life. I. Love equals Jesus Christ. Throughout this little book, CW insists that this equation is exact, definite, and literal. It is not a metaphor; love is not “like” Jesus; we are not “like” Jesus when we love someone (well, we are, of course, but that’s not what he’s talking about here). The love between a man and a woman IS JESUS. I think it would be accurate to say that when we are in love, that is one of the many ways that we experience God’s love—but that is to reduce and to sanitize the wildness of CW’s teaching. It does mean that, certainly, but it means more. It is half of a mantra that CW would use frequently in his later writings: “This is Thou, this also is not Thou.” He believed that we had to say that to God about everything. When we are smashed by tragedy, we have to say of the tragedy: This is God (i.e., God has sent this, it is under His control, He is manifested to me through it—but again, that simplifies and domesticates CW’s more feral diction). But we also have to say of the tragedy: This is not God (i.e., this is because of sin and the fall of humanity, God does not want me to suffer, God has a plan in place to save me from my suffering ultimately, and so forth). We always have to say both of any object, person, experience, event, etc. 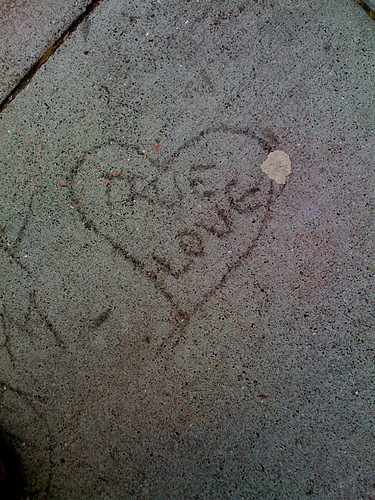 So it is with romantic love. When I look at my Beloved, I need to say: he is God (in the sense that God is revealing His divine love to me through this man’s love), and I need to say: he is not God (he is a created being, he is a sinner, etc.). Of the love-experience itself—the whole course from falling in love through marriage until death—I need to say: this is God (I know God through it) and this is not God (I must not idolize this experience or have false assumptions about its blissful continuity). II. Marriage equals the life of Christ. The Massacre of the Innocents ≈ the “normal human relapse and boredom which follows swiftly” after the initial “high experience” of the first days of passionate love (p. 19). Jesus’ Childhood in Nazareth ≈ I am not certain, but I think this corresponds to the engagement period; it is what CW calls the “years of retirement” that intervene before the wedding (p. 20). Maybe this somewhat explains his own nine years of engagement to Florence? Jesus’ Baptism ≈ the Wedding. The Temptation ≈ perhaps the temptation to give up on the pursuit of Romantic Theology, to stop doing the hard work of seeing the spouse as God sees him/her, and to stop working at the difficult process of sanctification as it specifically plays out in marriage. It is also a temptation to give in to “depression, boredom, monotony, dislike” (p. 21). The Transfiguration ≈ again, CW is not explicit here, on purpose. He does not want to reduce this theology to a neat chart (as I am doing!). But based on the discussion of the Temptation, above, it seems clear that the Transfiguration is transforming the lovers out of that phase of passivity. Later, he mentions that any number of these stages can be gone through over and over, and not in this order. That seems like common sense. the Ascension ≈ the time when “Love that was visibly present, a light and a wonder, withdraws himself into the secret and heavenly places; and in His stead there descends upon the lovers the indwelling grace of the Spirit, nourishing and sustaining them” (p. 25). Whether this is after the death of one spouse is not stated. Quite likely CW intend this point, as all of them, to have multiple applications. Now I really have done a disservice to this book by using up more than my usual word allotment and only talking about the first two chapters. Yet it is essential to understand the principles CW lays down in this unusual little book. I encourage you to get a copy of this slim volume and evaluate it for yourself. And keep in mind, again, that this is his early statement on the topic; for his final thoughts, we’ll have to wait 20 years (or at least 20 blog posts) for The Figure of Beatrice. This entry was posted in Book Summaries and tagged book summaries, love, Romantic Theology, theology. Bookmark the permalink. It is worth here following the first sentence you partially quote, with part of the one preceding it and part of the one after it (p. 7): “It is a theology as exact as any other kind, but having for cause and subject those experiences of man which […] are generally termed ‘Romantic’.” And, “That there are other human experiences of this same far-reaching nature is undeniable – nature and friendship are perhaps the chief”. This description would, I think, bear fruitful comparison with a book published nine years later, in 1933, by his younger future friend, C.S. Lewis, which bears the subtitle, “An Allegorical Apology for Christianity, Reason and Romanticism”: Pilgrim’s Regress – especially if we include the “Preface to Third Edition” which Lewis added in 1943. Having noted that, Williams does explicitly go on to focus “almost entirely” on “the principles of Romantic Theology as applicable to romantic love” (p. 7). Mrs. Hadfield notes in her Introduction (p. x) that on 21 August 1924 John Pellow records in his diary that Williams “is writing Outlines of Romantic Theology, a prose version of Divorce, and Conformity” – his third and second volumes of verse respectively. She adds, “Pellow had not, of course, then seen Windows of Night, which was to be published a few months later.” In fact, C.W. had read poetry which would eventually appear there to the Pellows as early as 23 April 1921, and sent him several more such poems on 19 November 1923, while 3 May 1924 finds Pellow glancing “thro’ the MSS. of New Poems (the present title – but not finally settled upon).” The letter to Pellow of “5 September ” in which C.W. discusses “the pronunciation of ‘Palomides’ ” (Exploration, pp. 48, 239, note 33) actually does so, if I am not mistaken, in the context of Pellow reading the proofs of Windows of Night for him. This more inclines one to think in terms of ‘Your Wife is (Mystically) the Mother of Jesus’. We might see as anticipating C.W.’s note that “anything that is postulated of his experience is postulated also of the woman’s”, his discussion in the Commonplace Book of the difficulty in his projected epic of Galahad having a devotion to the Virgin Mary, as, in the poem, he images her. So, we might, however surprisingly, equally think in reference to a wife, ‘Your Husband is (Mystically) the Mother of Jesus’! For starters, in his attention to “a teaching which had already been very fluidly treated since Augustine first described the three goods of marriage as ‘offspring, faith and sacrament’, a trio of ascending dignity corresponding to body, soul and spirit”, and the Sixteenth-century “Anglican Reformers, whose priority it was to free themselves from the incubus of Peter Lombard’s theory of the seven sacraments, reasserting the unique place of baptism and eucharist. They reconceived the third good to skirt around the sacramental reference and to incorporate certain aspects of the second good that risked being lost sight of”.